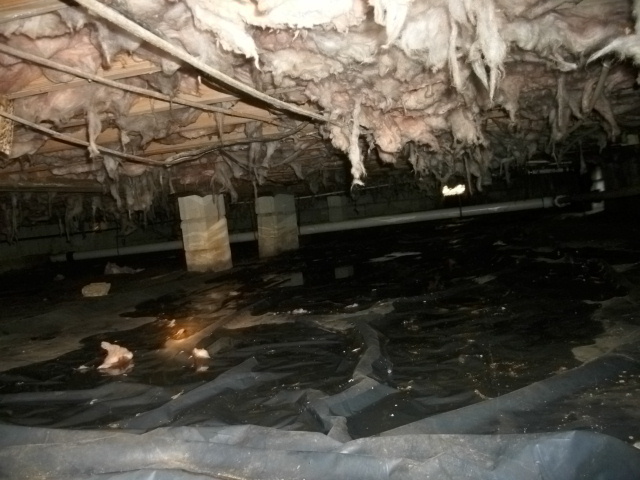 Did you know that sometimes the insulation in the crawl space gets damaged? “How can that be?”, you ask. Well, at least I did. Take a look at the pic below. What do you think caused this? HINT: Look down as well as up. 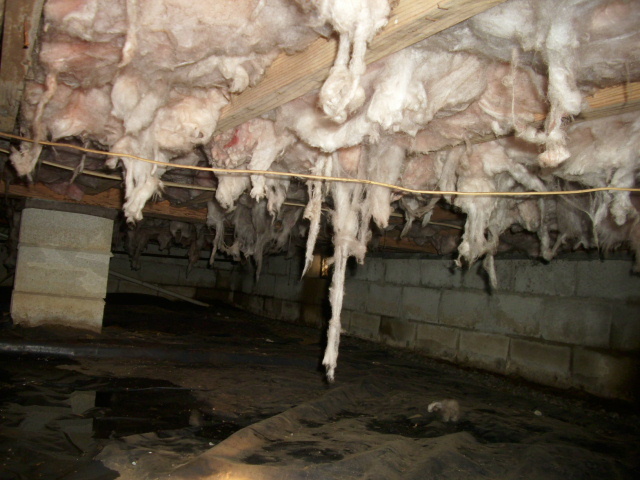 ANSWER: This is what insulation can look like after it has gotten wet. The pooled water on the moisture barrier is left over after the May 2010 floods in Nashville, TN. The water was high enough in the crawl space to reach the joists and insulation. See another picture below. 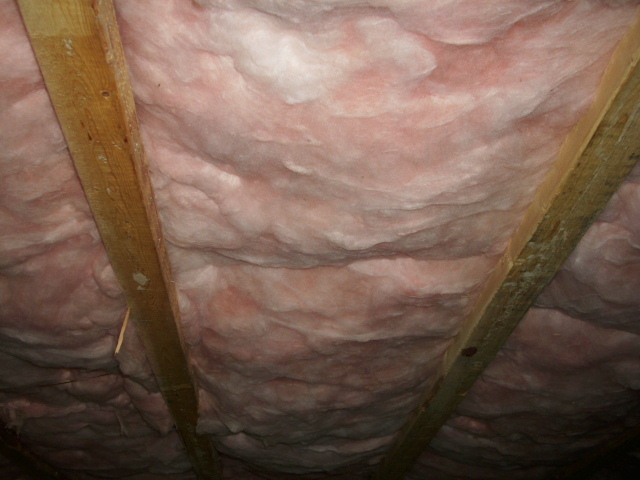 Depending on the extent of the damage, this insulation may have to be replaced. Surely the area above the insulation has to be checked for water damage as well. Below is what it should look like. Comments in this blog posting are the copyrighted intellectual property of Richard Acree, President, HABITEC Home and Building Inspections, LLC, and are intended to educate and otherwise assist home owners, sellers and buyers, building owners, sellers and buyers, realtors, real estate investors, property managers, and lenders in the process of owning, buying or selling homes or commercial buildings. HABITEC is a residential (home) and commercial building inspection company serving Middle Tennessee including Nashville, Brentwood, Franklin, Murfreesboro, Smyrna, Mt. Juliet, Hendersonville, Dickson, Belle Meade, Columbia, Spring Hill and more! In addition to building inspections HABITEC offers Environmental Services for mold assessments, radon testing and water quality analysis. Additional information about HABITEC can be found on our website at http://habitecinspections.com, or call 615-376-2753. Richard Acree is the author of the HABITEC Home and Building Inspections blog at ActiveRain, WordPress, and Blogger, and Founder of the ActiveRain Group Tennessee Home and Building Inspectors. All are welcome to join and comment on those blogs and group. You can also follow HABITEC on Facebook and Richard on Linked. Thank you!